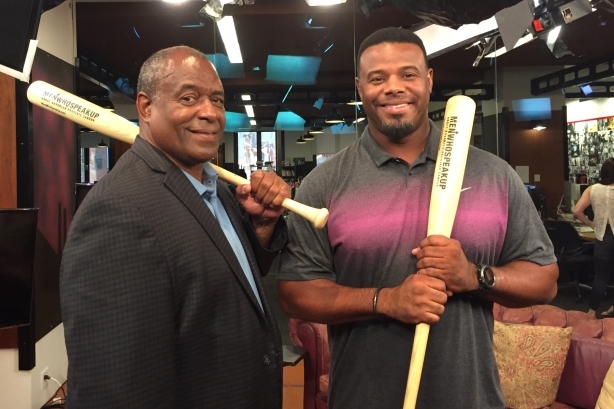 Bayer recently tapped Ken Griffey Sr. and Ken Griffey Jr. as spokespeople for the campaign. Baseball legends Ken Griffey Sr. and Ken Griffey Jr. are helping Bayer to spearhead advocacy efforts for its campaign to empower men to speak up about symptoms of advanced prostate cancer and seek help. Bayer tapped the Griffeys as spokespeople for the campaign, which is called Men Who Speak Up. Griffey Sr. is a prostate cancer survivor. Men Who Speak Up launched one year ago, but Bayer is constantly adding new elements to the ongoing campaign. In the U.S., prostate cancer is the second most common cancer among men. Bayer has made the disease a priority focus for its oncology franchise, which includes Xofigo, a treatment approved by the FDA for treatment of metastatic castration-resistant prostate cancer. Men Who Speak Up was born when Bayer, with the support of its AOR Cohn & Wolfe, approached leading oncology patient organization CancerCare to spearhead the formation of the International Prostate Cancer Coalition (IPCC). With support from Bayer and its member organizations, the IPCC commissioned the International Prostate Cancer Symptoms Survey to learn how symptoms impact men and their loved ones. Over 1,300 men with advanced prostate cancer and caregivers across 11 countries participated, making this the largest known survey to date on advanced prostate cancer. Bayer used these survey findings to build Men Who Speak Up. "The primary goal of the campaign is to activate patients around the symptoms of advancing prostate cancer and amplify the critical need for a shift in the conversation taking place between patients and their doctors relative to symptoms," explained Steven Immergut, VP and head of communications, pharmaceuticals at Bayer. "Early on, we made it clear that Men Who Speak Up should raise the collective voices of those living with and affected by advanced prostate cancer, including patients, caregivers, doctors, and advocacy groups." With help from Cohn & Wolfe, Bayer sought to forge partnerships to raise publicity for the campaign, execute an effective social media campaign using branded channels, and engage a prominent influencer as a spokesperson. After the global survey fielding wrapped in mid-summer 2015, Bayer and the IPCC launched the survey results and campaign at an international media event at the European Cancer Congress (ECC) in Vienna. Last November, Bayer forged a partnership with American Cancer Society’s Coaches vs. Cancer program, which involved Men Who Speak Up being named the title sponsor for a college basketball tournament. During the tournament series, Bayer delivered program materials directly to the patient community attending the games. Tournament coaches mentioned the program in online promo reels, and courtside signage increased visibility among television and YouTube viewers. To commemorate World Cancer Day on February 4, 2016, the PR team announced that Ken Griffey Sr. and his son Ken Griffey Jr. would be joining the campaign as spokespeople. This announcement included a PSA with advocacy partner Zero – The End of Prostate Cancer and embargoed stories in The New York Times and USA Today. In addition, the announcement coincided with Griffey Jr. activating a "takeover" of the Bayer U.S. Instagram handle. This summer, campaign efforts featured a satellite media tour featuring 28 TV and radio interviews with Ken Griffey Sr. and urologist Dr. Neal Shore -- both of whom shared their support of Men Who Speak Up with local broadcast stations across the country. Bayer also hosted a New York City media day with Griffey Sr. and son, generating seven in-person interviews with top tier news outlets, including Huffington Post, Men’s Fitness, and Sports Illustrated Now. Additionally, the campaign team launched a social media activation on June 17 encouraging online users to "take a swing" against prostate cancer by posting photos on their social channels with Men Who Speak Up sponsored bats that were shipped to select advocacy partners and media. "The community got really creative with it, and we got a great response," said Immergut. "Ken Griffey Jr. posted a photo on Instagram of himself and his dad with one of our bats, which was his most popular post in three months [garnering over 14,000 likes]." Eight groups have engaged as IPCC member organizations, including CancerCare and the Prostate Cancer Research Institute. In addition, 10 groups have joined the movement across the world following program publicity and outreach efforts, such as: Movember, Ed Randall’s Fans for the Cure, and American Cancer Society’s group Coaches vs. Cancer. The campaign surpassed 180 million traditional and social media impressions worldwide from June 2015 to March 2016 via media outreach efforts, which consisted of 70 interviews, 84 original stories, and more than 2,000 PSA airings. During Men's Health Month this June, the campaign generated 233 million traditional media impressions via Griffey Sr.'s interviews with seven top-tier media outlets. The branded website for the campaign has seen 88,726 cumulative website visits and more than 128,571 page views to date, with more than one-third of users spending between 5-30 minutes on the site per visit. "We’re very pleased thus far with our metrics in terms of acceptance by the community and general visibility through traditional and social media along with other channels," said Immergut. "Anecdotally, we know the messages are resonating." Going forward, Immergut explained that Bayer is taking the campaign one step further to measure the impact it is making on conversations at home and in the doctor’s office. Bayer will be working with the Griffeys for another year, at minimum, and will be back out in the community this fall and throughout the course of 2017 at local events. Launches in Germany, Spain, and the U.K. are rolling out through the end of 2016, and new channels are continuing to be identified to deliver program messages.